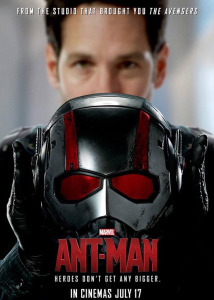 For you podcast listeners, this week my crew and I take in Ant-Man. It may be Marvel’s biggest risk yet — this week the Showcase crew discusses how Ant-Man stacks up against the rest of the Marvel Cinematic Universe! Is it too little, too late, or will this be the movie to prove that good things come in small packages? And what’s cool this week? In what may be the most diverse array of choices ever, Erin is in the midst of an X-Files rewatch, Jason recently discovered the classic The Manchurian Candidate, Mike is finishing a read of Jamie Delano’s Animal Man, and Blake just binged the sitcom Holliston. Posted on July 20, 2015, in Geek Punditry, Superhero and tagged 2015, Ant-Man, Evangeline Lilly, Judy Greer, Marvel Cinematic Universe, Michael Douglas, Paul Rudd, Peyton Reed, Superhero. Bookmark the permalink. Leave a comment.